The inspiration behind this piece is entirely clear and one that I can easily direct you to: “Imagine a Forest: Designs and Inspirations for Enchanting Folk Art” by Dinara Mirtalipova. This book is simply lovely and an absolute must-browse for anyone that has an interest in Eastern European design. Having worked in a public library for 6+ years, I’m very much inspired by books and this one drew me in the moment I saw the cover. Taking in Mirtalipova’s illustrative style, I was inspired to get out of my comfort zone and create a piece based on the instructions in her book. While her recommended media is paint, I decided to try her style in the form of embroidery. 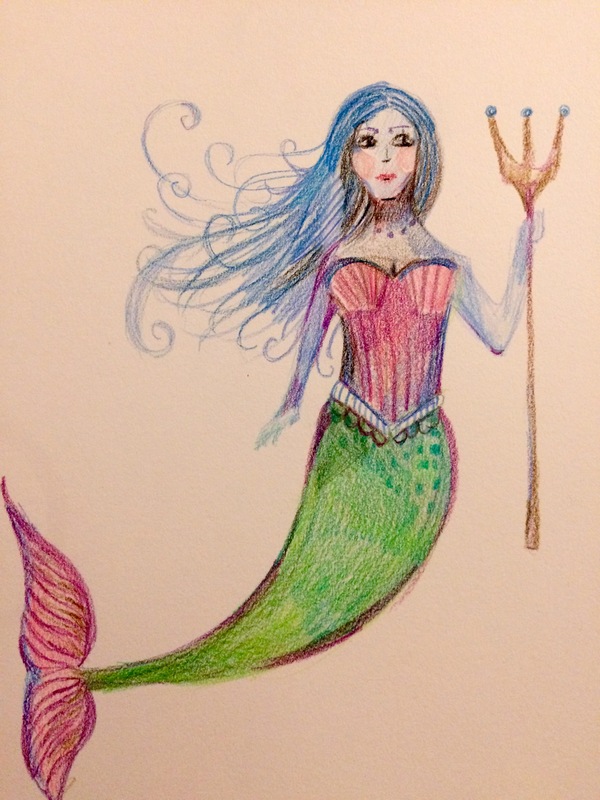 I was especially attracted to her take on mermaids, and thought that this sea queen would be a perfect summer project! While I was working on this piece I also developed a sketch to get a better grasp of the character. This can be a useful tactic when your subject matter is human or humanoid, and you’re looking to capture a specific persona. Although tedious, embroidering the scales for the mermaid’s top was also fun and I’m in love with the end result. I would definitely recommend Mirtalipova’s book to anyone interested in design, illustration and folklore! I know that for me it definitely proved to be a successful source of inspiration.